In terms of space, Central Asia has a lot of it. With a com­bined land area of 3,926,790 square kilo­metres, the Five Stans cov­er 2.63 per­cent of the world’s land­mass. Although that is an area far lar­ger than India, Cent­ral Asia has a pop­u­la­tion dens­ity of just eight­een people per square kilo­metre. India, by com­par­is­on, is 25 times as densely pop­u­lated. What is in all of that space in-between the people? What does the nat­ur­al world con­jure across Cent­ral Asia? In this art­icle we take a trip to six of the most extraordin­ary centres of the nat­ur­al (and unnat­ur­al) world of Cent­ral Asia, to dis­cov­er how the people of Cent­ral Asia are both shaped and shap­ing the vast envir­on­ment around them. It makes sense to begin with the “Roof of the World” — the Pamir Moun­tains. Writ­ten about in the West since the time of Ptolemy, cen­tur­ies ago three branches of the Silk Road used to cross the Pamirs. Whilst most of the range lies with­in Tajikistan, its fringes seep into Afgh­anistan, China and Kyrgyz­stan. A diverse array of soci­et­ies live in semi-autonom­ous and autonom­ous areas of the moun­tains. Many are small nomad­ic com­munit­ies of Tajiks, but size­able pop­u­la­tions live in small cit­ies such as Kho­rog. 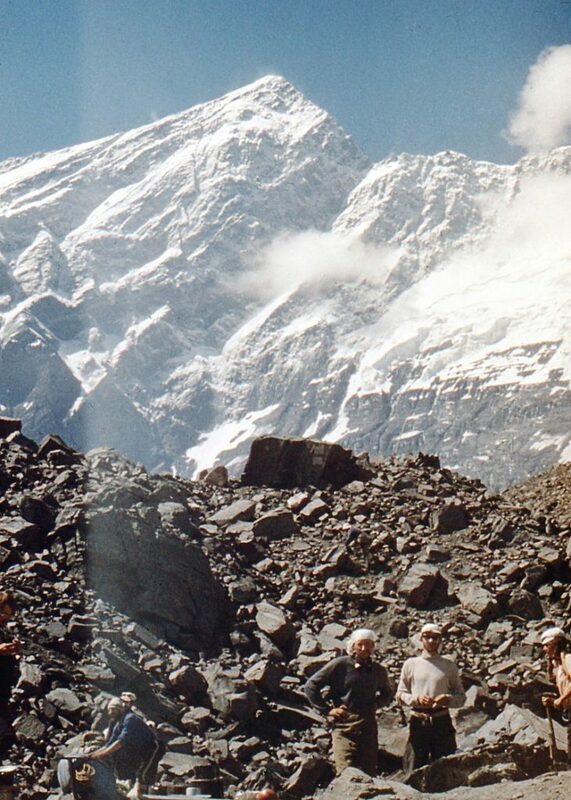 Climbers in 1978 pose for a pho­to­graph with ‘Peak Com­mun­ism’, as the highest point in Cent­ral Asia was then known. The tallest peak of the Pamirs — Kongur Tagh — is not in Cent­ral Asia, but China. Ismoil Peak is the highest in the region, at a mod­est 7,495m — the fiftieth tallest moun­tain in the world. Formerly known as Peak Com­mun­ism, the moun­tain was more formerly still named after Joseph Stal­in, but gained its cur­rent name in the late twen­ti­eth cen­tury to com­mem­or­ate the Saman­id emir, Ismail Samani. From the heights of heav­en, we jour­ney to the Gates of Hell. Yes, the door to the under­world can be found in Turkmenistan’s Karak­um Desert, 275km north of the country’s cap­it­al. The Dar­vaza Gas Crater emerged in 1971 fol­low­ing a Soviet drilling acci­dent. In an attempt to extract oil, engin­eers rup­tured a nat­ur­al gas pock­et unearth­ing an enorm­ous crater, and swal­low­ing up the rig. Imme­di­ately, tox­ic gas spewed from the 230 feet-wide crater and anim­als in the area soon began to per­ish. 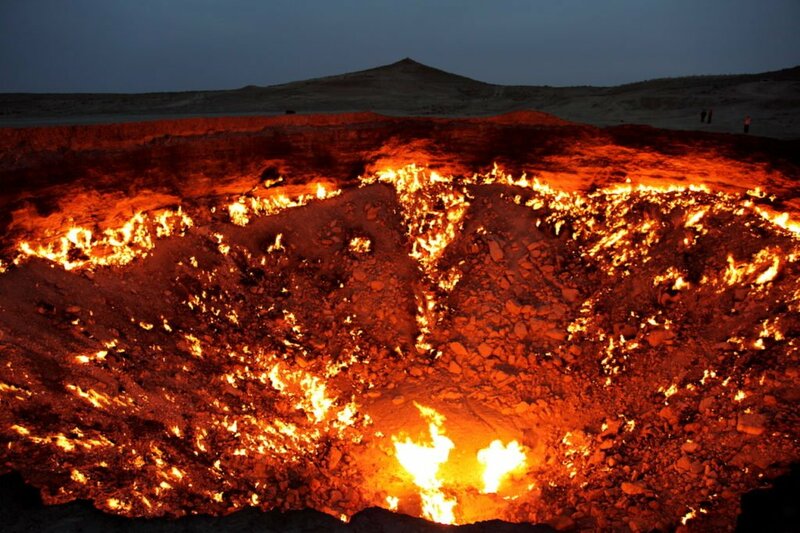 In an attempt to cull the spread of meth­ane, geo­lo­gists opted to set the crater on fire, and thus the Flames of Hell came to Earth. It is not unusu­al for gas craters to be set on fire but, usu­ally, they extin­guish with­in a few weeks, months, or at most, years; no one knows when, or even if the Dar­vaza Crater will stop burn­ing. Today, the Gates of Hell is a pop­u­lar tour­ist attrac­tion, which Google help­fully informs us is “Open 24 Hours”. The fam­ous ‘dis­ap­pear­ing lake’ act. Tragedy hit Cent­ral Asia in the 1960s, in what many experts believe to be one of the greatest eco­lo­gic­al dis­asters of all time. 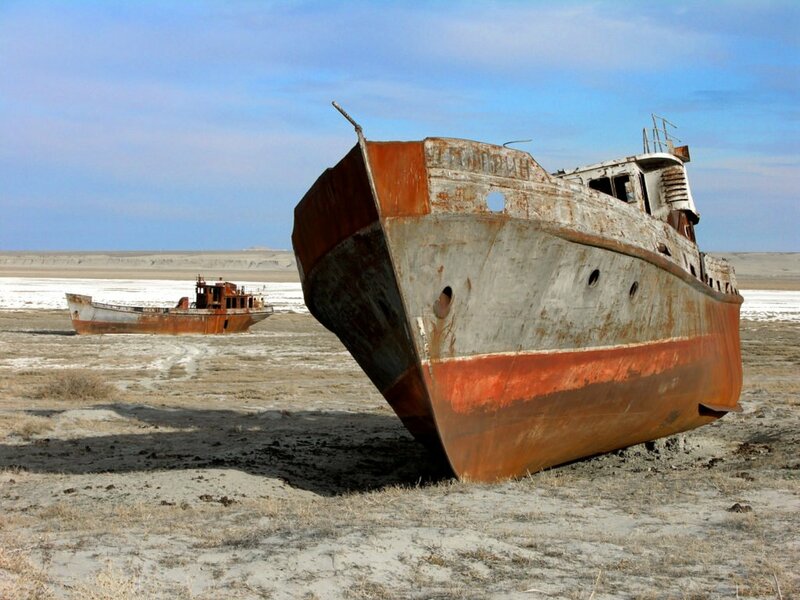 The Aral Sea was one the world’s fourth-largest lake — the second largest in Asia. Cov­er­ing 26,000 square miles, it truly was one of the nat­ur­al won­ders of the region, divid­ing a chunk of bor­der between Kaza­kh­stan and Uzbek­istan. Fish, and thus the loc­al fish­ing industry, has declined immensely since the dis­ap­pear­ance of water. This pho­to­graph of a beached fish­ing ves­sel in the Bay of Zhalanas, Aral­sk, Kaza­kh­stan, illus­trates the point. Today, that bor­der requires not a boat to cross, but feet. In the 1960s, as part of the Soviet eco­nom­ic plan to make Cent­ral Asia the world’s largest pro­du­cer of cot­ton, the two great rivers of Cent­ral Asia were diver­ted for an irrig­a­tion pro­ject. The Amu Darya and the Syr Darya had fed the Aral, but cata­stroph­ic neg­li­gence rap­idly depleted the sea’s water sup­ply. By 1990, the sea split in two, and by 2003, the depth had fallen by 72 feet. Even­tu­ally, the Aral held just one-tenth of its ori­gin­al volume. Fish­ing ports turned to bar­ren waste­lands and dust bowl­ing swept up sand and chem­ic­al residues from the now exposed seabed. 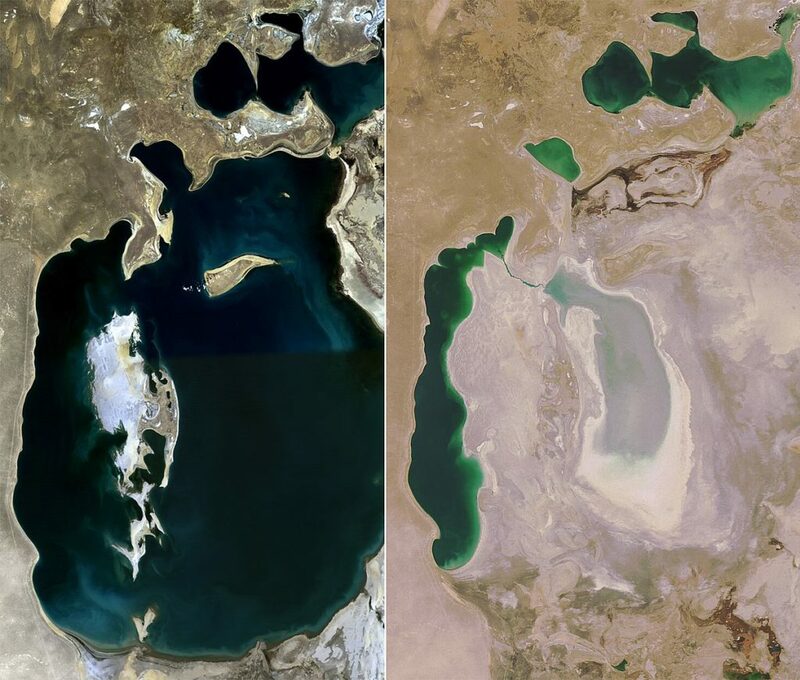 Although a glob­al effort led by the World Bank has sought to rein­vig­or­ate the North­ern Aral Sea, many experts believe that the vast major­ity of this once great lake will remain bar­ren. The Aral Sea dis­aster provides a stark and rather apo­ca­lyptic pre­quel to the world’s loom­ing water crisis. At elev­en times the length of Canada’s Ath­abasca Gla­ci­er, the Fed­chen­ko Gla­ci­er is the world’s longest non-polar Gla­ci­er. 2000km away from the Aral is Fed­chen­ko Gla­ci­er, the world’s longest non-polar gla­ci­er. First dis­covered in 1878, it is by far the biggest gla­ci­er in the Pamir range and its run­off even­tu­ally trickles into what is left of the Aral Sea. The ice on Fed­chen­ko Gla­ci­er, found in the east of Tajikistan, is 1000m thick in parts and meas­ures 77km in length. Put in per­spect­ive, Canada’s fam­ous Ath­abasca Gla­ci­er is just 7km long. The source of Fed­chen­ko is found in Gorno-Badakh­shan province upon Revolu­tion Peak, the highest point in the east­ern part of the Yazgulem Range. 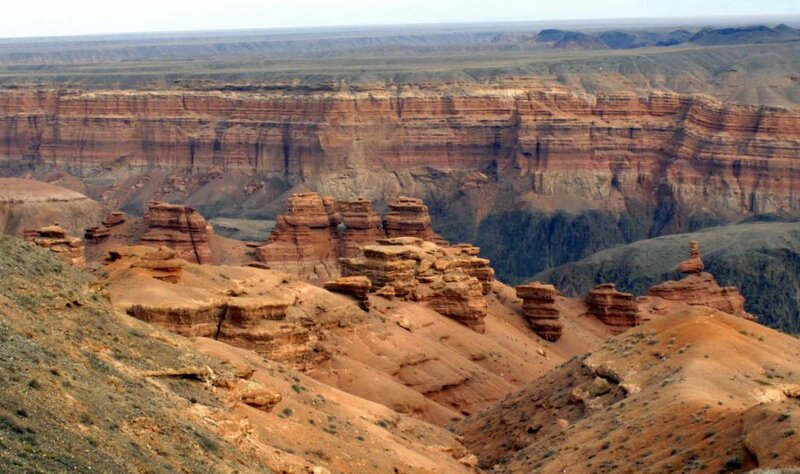 Kazakstan’s great Canyon will most likely become grand in the next few hun­dred mil­lion years. Close to the bor­der with China is one of Cent­ral Asia’s more unusu­al sites: Sharyn Canyon. The val­ley began to be formed rather recently — just 90 mil­lion years ago. Its most fam­ous point — The Val­ley of Castles — provides the off the beaten track tour­ist with some truly epic pho­tos for their Ins­tagram. Although it is dwarfed by the Grand Canyon for length, it is still nearly 100km long, and holds some remark­able eco­lo­gic­al sites. A pre­his­tor­ic forest, for example, con­tain­ing a large num­ber of Sog­di­an Ash, a par­tic­u­larly rare spe­cies of Ash. Sharyn Canyon Nation­al Park is 120 miles east of Almaty and the stag­ger­ing views of the ancient dust-orange rock canyon walls are a key attrac­tion for Kazakstan’s incip­i­ent tour­ist industry. 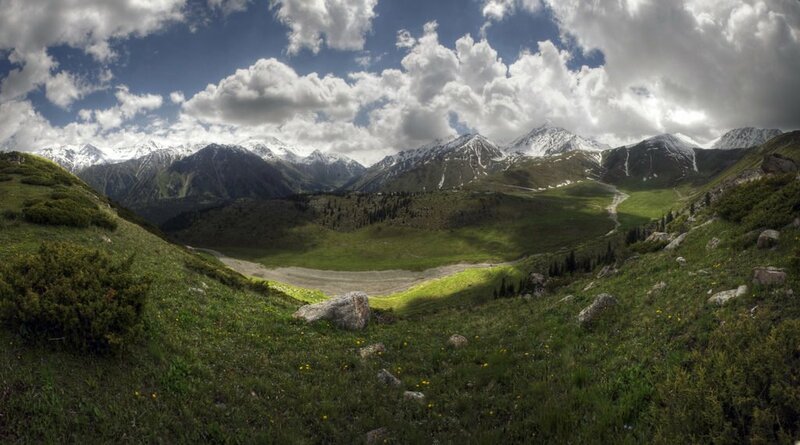 Kaza­kh­stan is the alleged birth­place of can­nabis, and in the Chuy Val­ley, 400,000 hec­tares have grown wild in amongst the Tien-shan moun­tains. Ever since the restrict­ive drug policies of the Soviet Uni­on, this has been some­thing of a polit­ic­al head­ache; where­as nature was defeated in the Aral Sea, the hardy nature of wild can­nabis has allowed the crops to sur­vive mul­tiple erad­ic­a­tion attempts, mak­ing can­nabis Kazakhstan’s most potent per­en­ni­al weed. Under the cov­er of night, loc­als are known to des­cend into the val­ley to col­lect small quant­it­ies of wild can­nabis — which is famed for a low potency and con­sequent lack of hangover effects. Large-scale har­vest­ing is inhib­ited by an annu­al police crack­down on efforts to organ­ise col­lec­tion efforts — as such, organ­ised crim­in­als rub shoulders with bohemi­an enthu­si­asts, with no groups hav­ing a mono­poly on the region of nat­ur­al abund­ance. A ‘high’ val­ley in Kaza­kh­stan. Photo: Mari­usz Kluzniak. There is your heav­en to hell then — a whistle-stop tour of the nat­ur­al won­ders of Cent­ral Asia. Though it would rarely come to mind when we think of the epic of our nat­ur­al envir­on­ment, Cent­ral Asia pos­sesses some of the most remark­able examples of the undis­covered, the unbe­liev­able, and unfor­tu­nately, the unnat­ur­al. Whilst the Dar­vaza Gas Crater is an example to poke fun at, the Aral Sea dis­aster is not. Per­haps the great meas­ure Cent­ral Asia’s nat­ur­al won­ders is, then, humankind’s utterly fra­gile rela­tion­ship to the nat­ur­al world.